Big Bang Theory TV Guide Covers! 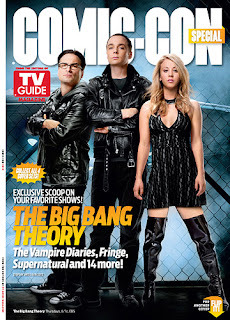 For the third year in a row, the cast of The Big Bang Theory is featured on one of TV Guide's special Comic-Con issues! One side of the magazine displays Leonard, Sheldon, and Penny, and it flips over to reveal Amy, Raj, Howard and Bernadette. The Big Bang Theory cover, along with covers also featuring Fringe (another personal favorite! ), Supernatural, and The Vampire Diaries, will all be distributed at the WB Booth at Comic-Con next week. For those not attending the convention, you can find them on newsstands starting on July 17th. Are any of you guys going to be at Comic-Con? I'll be there on Thursday and Sunday - can't wait!